Following a past entry from early 2009, I’ve received several requests for a portable isometric training device.Â Â The piece of equipment discussed in the original entry is obviously too bulky to pack when traveling. Fortunately, it will only cost a few dollars to build a portable unit.Â The device seen below was constructed from two lashing straps.Â I purchased the straps at a local hardware store (Harbor Freight Tools) for $2.99.Â I then cut a piece of pipe to form the handle. The total cost was less than $5. One cam buckle forms a foot strap at the bottom of the unit.Â This anchor point allows me to pull the unit with maximal force.Â I also add a small piece of rubber padding for a more comfortable fit around my shoe. 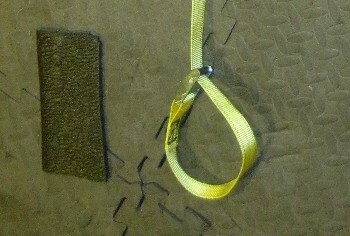 A second lashing strap and cam buckle are used for quick length adjustments. I used 12 foot lashing straps to build this unit, but I am only using the full length of one strap.Â I then cut the second strap to approximately 18 inches.Â You can see this short piece below at the black arrow. I’m only using this small piece for its cam buckle (which attaches to the 12 foot piece).Â This second cam buckle allows me to quickly change the length of the first 12 foot piece. The handle is actually another short piece of lashing strap that wraps through a short piece of pipe.Â I tied the second lashing strap (18 inch piece) to this handle.Â The knot is wrapped in duct tape. I can use this simple piece of equipment to perform several exercises.Â I can quickly adjust the length of the unit to target multiple joint angles. 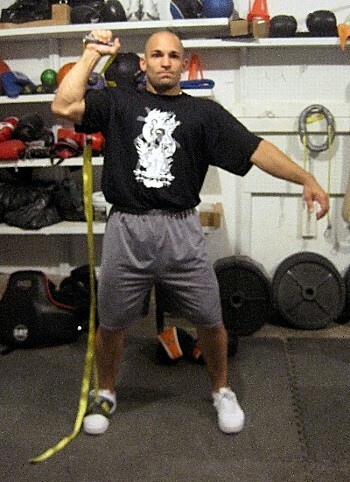 Below I am demonstrating an overhead press. 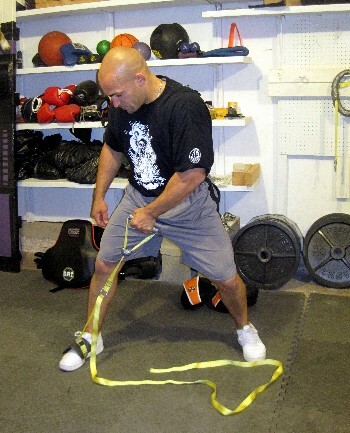 A variety of pulling exercises can also be performed. If you are looking for a portable isometric unit, this inexpensive option may come in handy.Â I’ve made considerable strength gains with isometrics for several years now.Â The simplicity of this tool certainly does not discount its benefits. Seems you could also simply use part of the suspension trainer and get two tools in one for those road trips. Not quite the same though ^, and the addition of the foot strap makes it useful when pulling hard (no slipping). There is also less to deal with in terms of excessive strap length (when compared to the suspension trainer). good idea, thanks Ross, and just in time too, because i’m traveling to El Salvador in the end of July, so this isometric tool is most def in addition to all the other things i’m packing like strong tension bands, 10lb med ball, ab wheel. Any good isometric routines anyone can recommend? How long is the cut of the pipe I have all the material all i need os to cut the pipe and get duct tape. I have already made a prtable isometric tool, its not as small as this one though. Mine is a piece of wood just long enough for me to stand on. 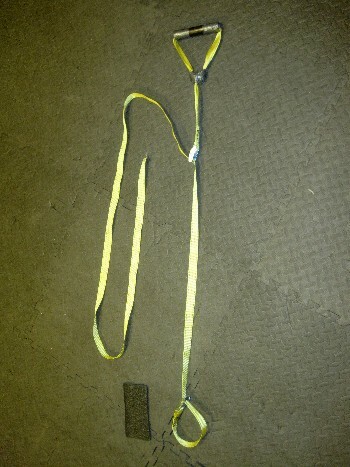 Attached on top os a speedbag swivel which is connected to a length of chain. 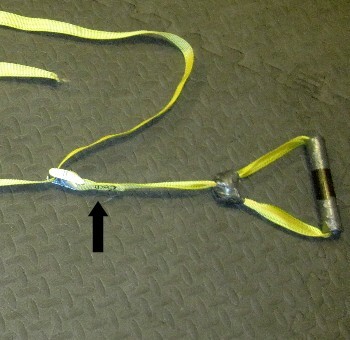 A chain handle connected by carabiner is connected to the chain and can be placed on different links for different angles and exercises. When not in use, the chain is folded into a small bag which ties to the swivel. The handle is connected to swivle also by carbiner and the wood threaded through the gap and held down with an elastic band. It slides into the bag of my bag so I can take it to work with me. Thanks so much for all of these equipment ideas. I’m always impressed by the ingenuity and simplicity – exactly what you need, nothing more, nothing less. It seems like you have gained some decent strength and muscle mass this last year, looking at these pictures. Do you mind letting us know how your training and eating routine has been while the muscle gain has occured? @Tiny – I wouldn’t worry too much about full isometric routines. Isometric training is best viewed as an addition to a more complete routine. Working to overcome a sticking point on a particular free weight exercise would be one example. Mini-workouts are also useful (ex. target a few exercises that you are currently working on). @John – I’d just cut the handle to your hand size. That’s what I did. Pipe is just one of many options. I happened to have some extra pipe from a d-bell handle I had made, so I cut off a small piece based on my hand size (gripping area). Once I hit 600, I’ll move on to something else. I love your blog and all your creative inventions. I am wondering if you could figure out a way to include a scale in an isometric training device. That way you could measure how many pounds you are pulling and set goals. Highly informative site with fantastic ideas. I made a similar bit of kit using some rope and then made 2 short loops from thinner rope into a prusik knot which can then slide up and down the rope to give different positions and will never come loose when under tension.